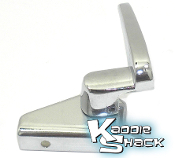 These billet aluminum window winders will give any interior a clean and finished old school look. They fit all years. 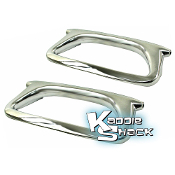 These window crank handles originally came on the '68 and '69 Beetles. They will fit all '68 and later Type 1, 2, or 3. 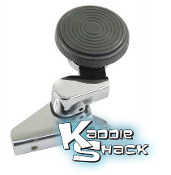 Their unique chrome base design adds an old school look, and are often viewed as stronger in design than the later handles. Sold each. Replacement window winder crank handle came on '75 and later bugs and buses, but also fits all '68 and later air cooled models. Replacement window winder crank handle came on '75 and later bugs and buses, but also fits all '68 and later air cooled models. This one is made by Hella, an original equipment supplier to VW. Dress up your interior with these stylish billet window winder and door handle buffer rings. sold as a set of 4. Many people don't realize that the late model cars have window crank buffers too, also known as escutcheons. They space the window crank handle away from the door panel. These fit '70 and later window cranks for Type 1, and 71 and later on Type 3. Sold in pairs. This is the mounting screw that holds the window winder crank handle to the window regulator on late model cars. If yours has a screw to secure it, this is the one. This is the cover plate that covers the mounting screw on the interior door latch cover plate. It slips into the plate after installed and covers the mounting screw. This is the cover plate that slips inside the door panel to cover the lock and mounts with one screw to the door. 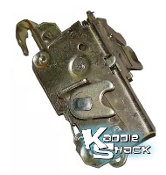 Need to replace a broken or scratched inner door handle latch on your late bug? Maybe you just want to upgrade it from a black one to a chrome one. This is a great quality replacement at an affordable price. 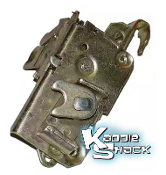 This is the door latch mechanism that the interior door handle is installed on in early doors. Pulling the handle moves the rod, which operations the mechanism in the door to release it from the jamb. 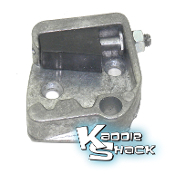 Replace your broken or ugly emergency brake handle with this brand new stock one. Great way to dress up your interior. Comes with all necessary hardware and internals. 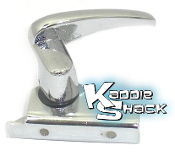 Replace your broken or ugly emergency brake handle with this brand new chrome one. Great way to dress up your interior. Comes with all necessary hardware. Were you working on your emergency (parking) brake, and had a part go "sproink"?. Now you can't find it? Is the button broken, or the pieces worn beyond repair? Don't fret. This repair kit has all the parts you need to rebuild the handle. 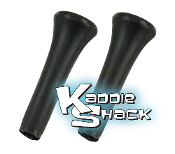 Has your e-brake handle grip come apart, or is it altogether missing? Here's a replacement! 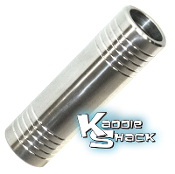 This billet aluminum e-brake handle grip slides right over your stock or aftermarket emergency brake lever to spruce up any interior. 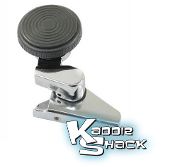 11-4533 Emergency Brake Button fits All Years - Billet (1) Dress up your interior with this stylish billet emergency brake button. 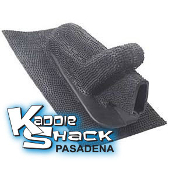 Hide those unsightly brake cables that come out of the center tunnel with this new black brake boot. Fits '64 and earlier. 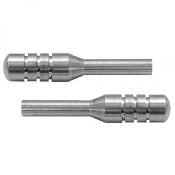 If your stock door lock pulls are dinged up or missing, here's a pair of matching replacements. Many cars we see are missing that covers the hole in the door where the interior door lock knob comes up through. These collars simply snap into place and guide the lock knob. This is the mounting screw that holds the door to the door jamb. It is super common for them to strip or break, as they've probably been in there a long time! Once a popular accessory, these spring loaded interior door pulls add a vintage look to your interior. They can be installed on either the door panel or the door itself. It is spring loaded, so it will fold flat when not in use. 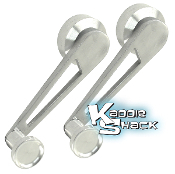 Dress up your interior with these cutsom looking stylish billet door handles. This is the door latch mechanism that bolts into the door that clamps around the striker in the door jamb. This is the door latch mechanism that bolts into the door that clamps around the striker in the door jamb. Fits all '68 & later except convertibles.